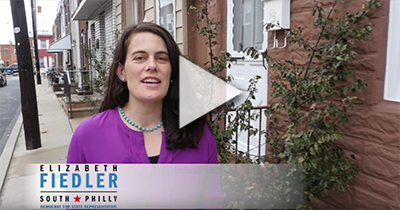 Elizabeth Fiedler, a former WHYY reporter, won a contentious Democratic primary for a state House seat in South Philadelphia, in the back yard of a major city power player. Fiedler campaigned on Medicare-for-all and received endorsements from several city unions; the Democratic Socialists of America’s local chapter; and Our Revolution, a group formed out of Sen. Bernie Sanders’ 2016 campaign. Fiedler bested Jonathan Rowan, a state Senate aide who received significant financial support from the city’s powerful Electricians union, in the primary for the 184th District. The rapidly gentrifying district includes Pennsport, the home neighborhood of John “Johnny Doc” Dougherty, leader of Local 98 of the International Brotherhood of Electrical Workers. That 184th District’s incumbent legislator, Bill Keller, also backed Rowan. Fiedler received more than 50 percent of the vote in the four-way primary, according to unofficial results, with Rowan receiving nearly 37 percent. Along with Rowan, attorney Tom Wyatt and former police Detective Nicholas DiDonato also ran for the seat. A last-minute attack ad said Fiedler, who is originally from Bloomsburg, Pa., said she “doesn’t know us” and “went district shopping.” Fiedler said she has lived in the city since 2003. The anti-Fiedler ads were paid for by Friends of Ward 39B, according to a disclosure on the mailers. The Democratic leader of that ward is Matthew Myers, who is Rowan’s uncle as well as the brother of Michael “Ozzie” Myers, a former congressman convicted of bribery. Amanda McIllmurray, a spokeswoman for the Fiedler campaign, added that Reclaim Philadelphia, an organization formed by former staffers of Bernie Sanders’ presidential bid, “played an instrumental role” in the former journalist’s victory. Two candidates supported by the Pittsburgh chapter of the Democratic Socialists, Sara Innamorato and Summer Lee, also won Democratic primaries for seats in the Pennsylvania House. They beat Dom and Paul Costa, members of a powerful Democratic political family.